June 3rd, 2015 By: GGT Category: Figure Review. Here we have 3 Futaba Express figure reviews today! This is our first time to have a prize figure review. Honestly I think the quality is pretty bad. 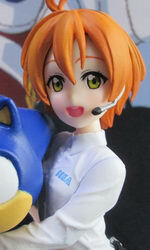 I have a lot of prize figures by SEGA and none of them is as bad as this Rin prize figure. But because of the Rin prize figure is really rare, people are selling it for around 4,000 yen up to 18,000 yen in Yahoo auction… (Oo.